I'm a qualified and highly experienced Senior UX / Visual Designer with solid understanding of web and mobile market, UI and technology over 15 years with more than 400 web projects working in different countries and industries for first-class companies. During this period I have also gained valuable experience in leading and mentoring design teams (including university teaching experience), as well 4 international awards as recognition of my web design work. I have an experienced background within digital including solid understanding of online business processes and digital technologies. Also I have the ability to work under pressure and I have excellent communication skills and line management experience. I'm a team worker, a problem solver and self motivated with the ability to work and delivery within strict time frames, budgets and meet objectives on schedule. I'm forward thinking and creative, as well highly talented and passionate when designing fresh, innovative, engaging and creative art work. I'm highly conceptual and emphasise for details. I have a strong understanding of how to deliver excellent quality solutions on smaller screens. Strong knowledge in responsive design, adaptive design and design of native apps. As a User Experience consultant, and specifically a user-centered designer, I study and evaluate how users feel about a system, looking at such things as ease of use, perception of the value of the system, utility, efficiency in performing tasks and so forth. I help guide and shape the development of interactive products and services based on what the user understands and requires with special emphasis on the human side of human-computer interaction and its affective results, rather than on the mere usability of computer interface design. As Visual Designer I design creative, interactive and functional websites and mobile applications and I deliver compelling, emotional and fun experiences for customers through any screen. I'm forward thinking, passionate, highly talented and creative person working in interactive projects across digital platforms with fresh, innovate and creative art work. 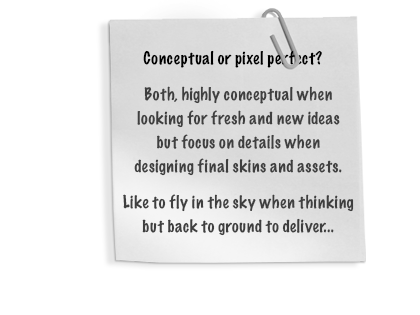 Highly conceptual and emphasise to details including pixel perfect when delivering. I have the ability to communicate complex ideas graphically and I have a strong understanding of how to deliver excellent quality visual solutions on smaller screens. I have a great experience in eCommerce and eBuiness working in business consulting with Ernst & Young and Soluziona where I implemented eBusiness solutions for several web projects, developed eCommerce strategies and identified and fulfilling new business opportunities.